The situation in the combat zone escalated over the last day as Russia-backed militants increased the number of attacks on the Ukrainian troops’ positions involving Minsk-proscribed mortars. Militants made seven precision attacks and fired over 40 rounds with 82-mm and 120-mm mortars, reported Ukrainian Ministry of Defense spokesman on ATO Colonel Dmytro Hutsulyak at a press briefing at Ukraine Crisis Media Center. In Luhansk sector, Russian proxies delivered two lasting attacks near Luhanske in the evening using mortars and grenade launchers and having fired twenty-nine 120-mm mortar rounds. Ukrainian troops returned fire with small arms. In Donetsk sector, Russia-backed militants committed five ceasefire violations, all in the afternoon. Militants fired eight 120-mm mortar rounds near Avdiivka and several 82-mm mortar rounds near Pisky and Verkhniotoretske. “In the above localities as well as near Novotroitske and Hranitne militants also used grenade launchers, heavy machine guns, and small arms,” the ATO spokesperson said. In Avdiivka area Ukrainian troops returned fire using grenade launchers and small arms. Unfortunately, one Ukrainian serviceman was killed in action near Hnutove at about 21:00 yesterday. As was reported yesterday, two Ukrainian troops were killed and five injured as their vehicle was blasted by an unknown explosive device in the early hours of January 17. 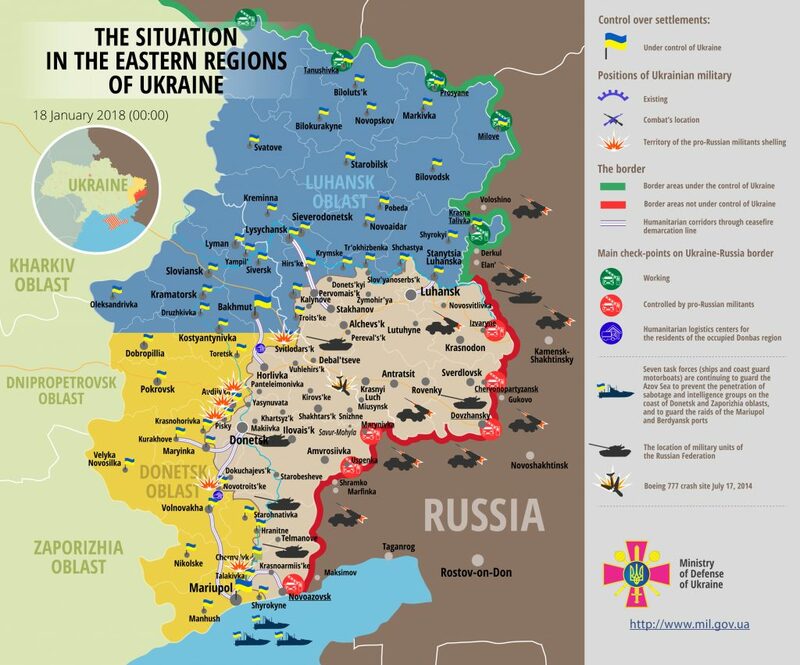 According to the ATO Staff, militants are planning provocations in both the government-controlled and uncontrolled territory. They plan to shell their own positions and residential areas on both sides of the contact line with heavy weapons. Report on the military developments as of January 17 is available here. Interactive data on the shelling: chronology shelling chart and the interactive map.